Dual input differential manometer with +/- 150 mBar input range. Use with TPI Smartphone Apps to display pressure. 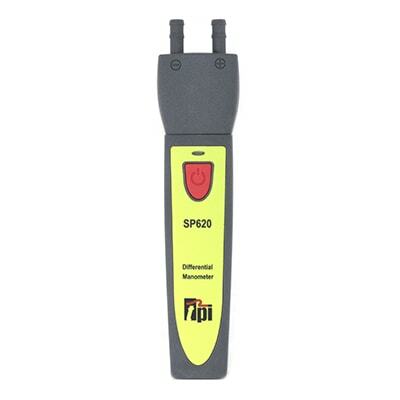 SP620 Smart Probe Differential Pressure Meter: one touch zero function and Trim mode to stabilize fast changing pressures. Seven units of measure: mbar, inH2O, kPa, PSI, mmHg, inHg, and mmH2O. Apps for both smartphones and tablets allow easy documentation that you can share with your customer. Reduce paperwork and save time! Perform differential pressure tests and more. See all available in the tab below. TPI offers several apps for use with your Smart Devices, each with differing features. TPI Smartphone apps allow easy documentation that you can share with your customer. Reduce paperwork and save time! Download both as available for your device to command the full range of smartphone & tablet features! Test pressure switch on a 2-stage gas furnace in both positive and negative pressures.